Merry Christmas everyone! Yeah, I know it’s only July, but I can start practicing now, right? I mean with so many presents to buy, christmas cards to send and visits to make I thought I’d begin practicing right here and now by giving out a … present. 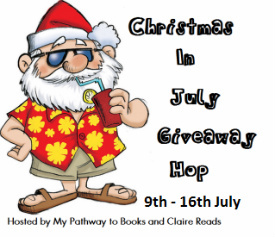 As you know Claire @ Claire Reads helped by Tess @ My Pathway to Books organized this year’s Christmas In July Giveaway Hop. This hop runs between July 9th and July 16th with the winner announcement on July 17th.